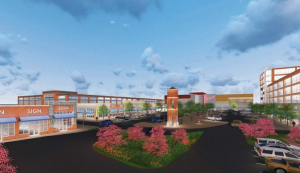 (Dallas, Texas) August 17, 2015 – Encore Retail, LLC, a subsidiary of Dallas-based Encore Enterprises, Inc., has acquired land to develop a 16+ acre high-density Class A mixed-use development in the affluent Town of Bedford, New Hampshire. The development will consist of fashion, recreation, fitness, dining and office space conveniently located on South River Road, in the heart of New Hampshire’s retail and business hub. The new Whole Foods is currently under construction contiguous to this site, and is scheduled to open in the spring of 2016. The development is planned to be in excess of 200,000 square feet. The development is already experiencing strong interest from regional and national retailers. “This project is part of our continued strategy of deploying funds from our newly raised acquisition fund. We have a large interest in continuing to find other attractive commercial real estate opportunities in New England,” said Bharat Sangani, Chairman of Encore Enterprises. Prellwitz Chilinski Associates (PCA), known for their upscale, mixed-use design with a signature creation of memorable retail and public space destinations, has been selected as the architect for the project. Theodore Chryssicas, of Newmark Grubb Knight Frank brokered the deal, and will handle retail leasing. Robert Rohrer, of Colliers International will handle office leasing. Construction on the project is expected to commence as early as the 4thQuarter of 2016. Encore Retail, LLC is a privately held commercial real estate company focused on the acquisition, ownership, development, redevelopment and management of retail shopping centers throughout the United States. For more information on Commercial Real Estate Opportunities contact Encore Retail, LLC., or call (214) 259-7000.